Leopard by Ben Heine is a part of his collection where he uses a contemporary technique called Digital Circlism which modernizes pointilism and combines it with Pop Art. This digital art shows the grace and beauty of a leopard head simplified into circles. 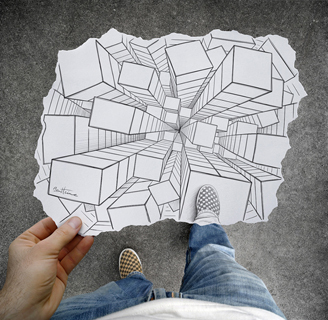 Ben Heine is a Belgian artist who has produced through the years a huge number of artworks. He is currently best known for his original series "Pencil Vs Camera", "Digital Circlism" and "Flesh and Acrylic". He has a degree in Journalism and is a self-taught person in drawing, digital photography and music (piano and drums). His graphic creations have been exhibited widely in Europe and more recently in Asia. His favorite art movements are Surrealism, Pop Art, Geometric Abstraction, Expressionism and Social Realism. He started creating electronic music in 2011. A documentary about his work was released in 2012. Ben is married to Marta and their son Theodor was born in August 2012. Hundreds of millions of people have seen Heine’s creations. He has exhibited and published his artworks all over the world since 2006. The artist presented his pieces of art in countless fairs and galleries in Belgium, South Korea, the UK, Romania, The Netherlands, Italy, Germany, France, Canada, the US, Turkey, Brazil, and Spain. Ben's pictorial works have been published in some of the most famous newspapers and magazines (see "Press" and "Exhibitions" for more info). Moreover, Heine has a huge presence on the Internet as well, and his works continually pop here and there on social media and online news outlets, making him one of the most watched artists on the web today. Ben is an enthusiastic traveller, he has visited hundreds of cities and countries, each one of them being a huge source of inspiration for his creative projects. 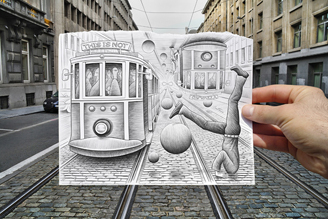 Ben Heine Art 17 is a part of his series "Pencil Vs Camera" in which Ben Heine creates 3D drawings that bring the surreal into the real world when combined with photography. In this whimsical piece, the artist is stepping into a world that appears to be made entirely of stacked cubes, reminiscent of being at the top of many skyscrapers looking down, trying to hop from one to the other without falling to the depths. Ben Heine Art 16 is a part of his series, "Pencil Vs Camera". In this particular fine art print, he captures a surreal and comical scene in which a man is doing a headstand in the middle of the trolly tracks, one trolly passing on the ground, the other suspended from the wiring above, upside down. Bouncing balls echo the image of the man's missing head. In the distance you can see the infinity sign, adding a conceptual flair to this whimiscal work of art. Ben Heine Art 15 is a part of Ben Heine's series, "Pencil Vs Camera". This pieces shows a symmetrical hallway, with two figures emerging from the walls towards each other. This piece is both romantic and sad, the love is apparent between the two figures, however they seem to be forever held apart, unable to touch. This fine art piece is captured in mostly neutral tones, and the graphite drawing has a pointillism like dappled appearance.